It has already been six months since my last check on the crowdfunding trends for video games. With everyone taking it slow because the summer is coming (I am joking, everyone is rabidly preparing for gamescom), here is the latest data and what I make of it. This is part one, as I will do another blog post on Tabletop Games. As a reminder, I use the word “semester” for half years. 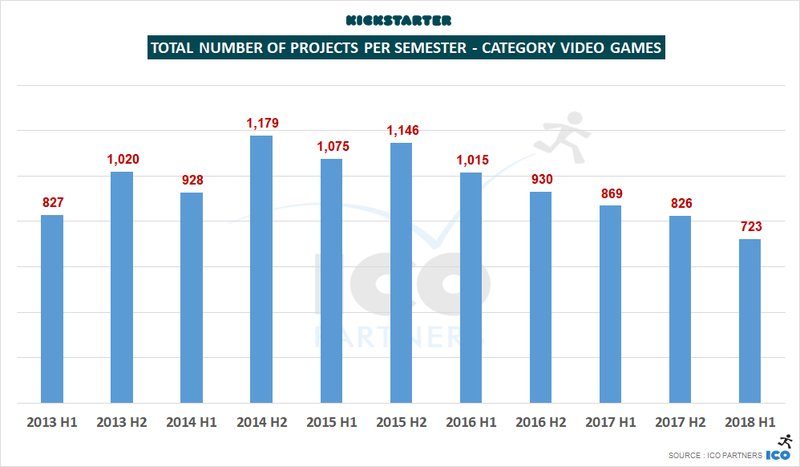 Looking at the total amount of money successfully raised through Kickstarter for video games, the first half of 2018 is at a level with the first half of 2017, sitting at +$400,000 from last year. It puts that semester as the best half year, in total amount raised, since the second half of 2015. The total amount of money pledged so far in 2018 is the highest it has been for the past 3 years. But the money pledged only tells part of the story, as we know now. Looking at the total number of video games campaigns seeking funding on Kickstarter, there is an obvious, regular decline. The numbers are going down overall: a -13% drop from the previous semester, compared to a -5% drop from the previous periods. 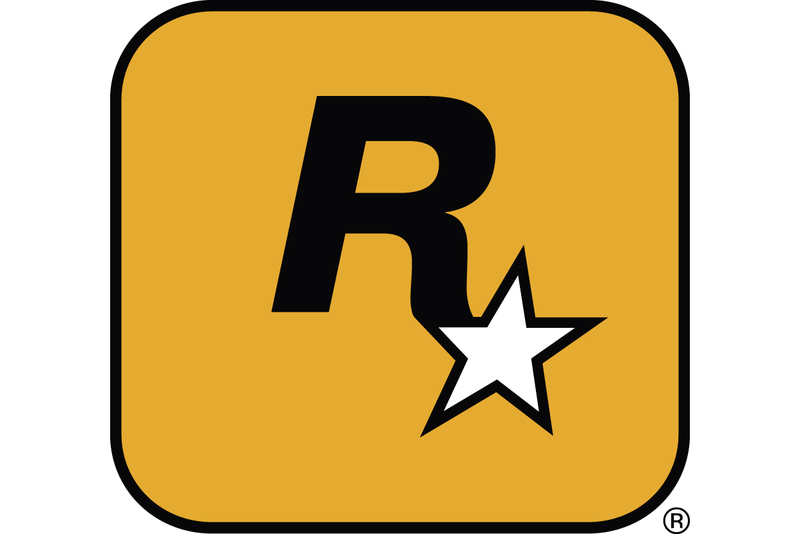 The total amount of video games campaigns launched is at the lowest since the first half of 2012. Interestingly, that drop in number of projects is not ostensibly affecting the overall number of projects being successfully funded. The number of funded projects compared to the previous semester is about the same, going from 168 funded projects to 166 funded projects. The drop in the total number of projects is mostly centered on projects that fail to reach their funding goal. Looking at the corresponding “Success ratio”, this is at its highest for video games projects since 2013. I do not believe that this means that it’s become easier to get funded. It probably derives from creators with the inability to put together a good campaign moving away from crowdfunding, as it is now understood how much work is required to manage a successful Kickstarter. 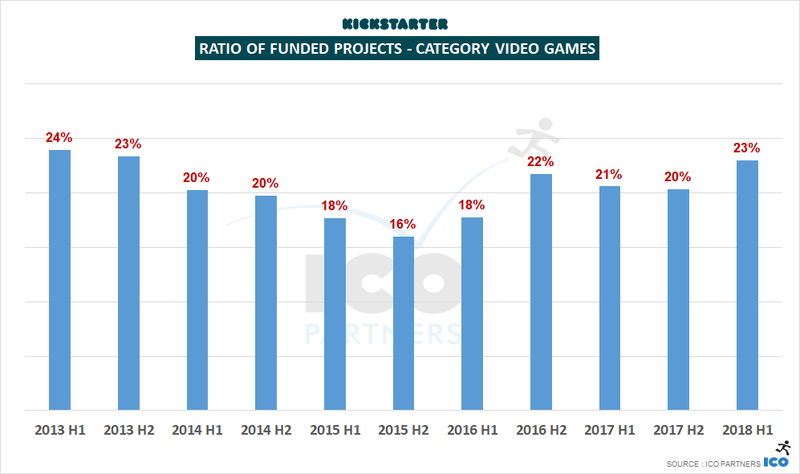 It is an interesting data point though, as there seems to be a perception from some studios I am talking to that crowdfunding a video game has become near impossible. It is hard to tell if the low number of projects raising under $50k highlight a trend of projects with smaller goals, and potentially lower production values, are receiving less funding, OR, if successful projects overall are managing to raise more money (bringing more projects to the higher tiers). With two projects raising more than $1 million in the past semester, it should not be too surprising to see that a significant part of the money came from the larger projects. The total amount of money raised by projects in the $100k to $500k range is at its lowest since 2012. 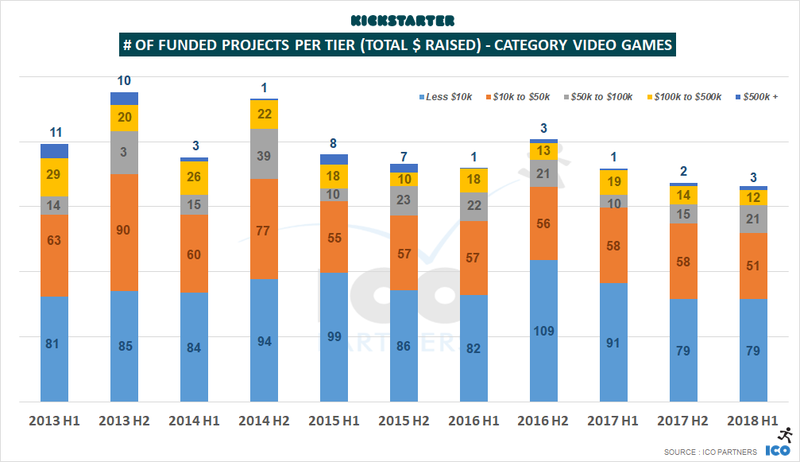 Projects in that tier raised the lowest amount on average since 2011 (prior to video games reaching scale on Kickstarter). Projects in the $50k to $100k tier have raised $1.5m+ in the first six months of 2018. It was also the highest average amount raised during a six months period for projects in that tier since early 2012. Projects in JPY (Japanese Yen) are only second to projects in USD in the most recent semester, in terms of total amount of money raised. It would be easy to think this is entirely thanks to The Good Life, and its $720,ooo raised. However, I wanted to point out there were 4 other projects in JPY last semester that got successfully funded, including “???????? ” that raised about $65,000. I think this is important to keep in mind as there is still a notion that you have to run your projects in USD in order to be successful. Your project’s quality and your capacity to build and engage with your community matter more than the currency you choose to run your campaign in. 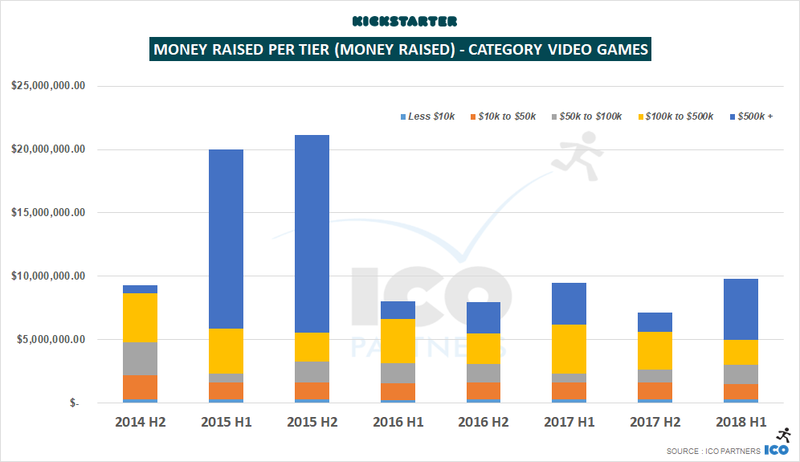 In January, I wrote an article for PC Games Insider on crowdfunding and video games, in which I drew a picture of the state of crowdfunding for video games, not just only on Kickstarter, but across four different platforms: Kickstarter, Fig, Ulule, and Indiegogo. I have since then refined my methodology, and found that I had overestimated the Indiegogo and Ulule numbers, especially in the case of Indiegogo. 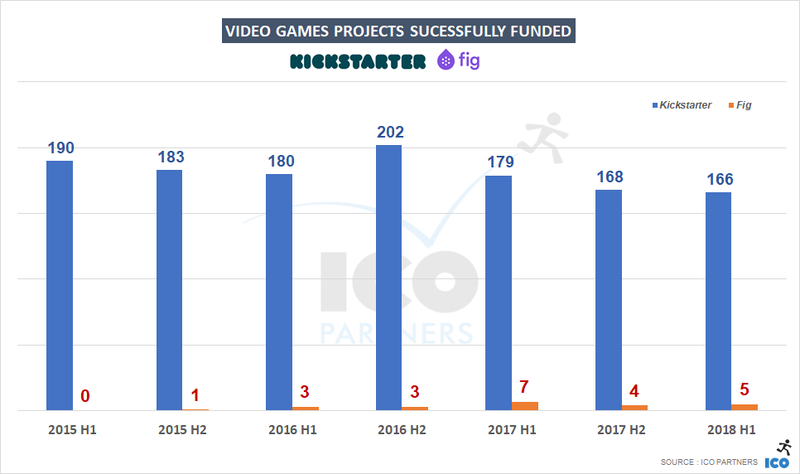 Both platforms are only anecdotally relevant to crowdfunding for video games, except for a rare outlier running on the platforms once in a while (Noob, the video game on Ulule in 2017, for instance). It does leave Fig as a second platform to keep track of, which is relatively easy as they curate their campaigns and the volume is small enough to handle manually. 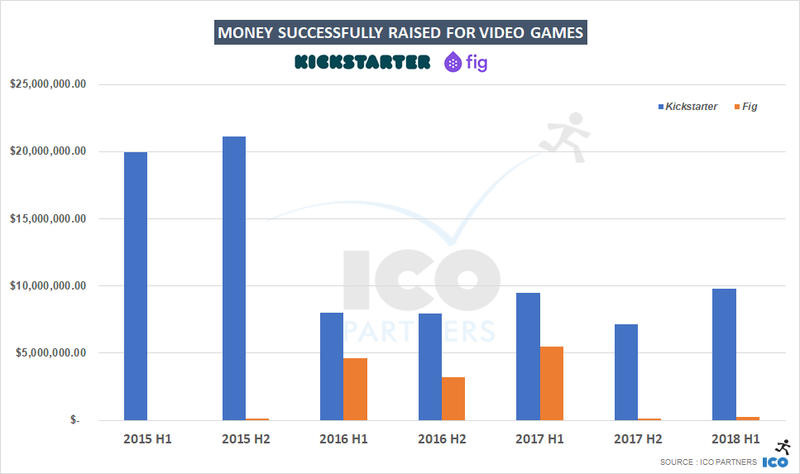 Here are few high-level data points on Fig’s performance since 2015 – just keep in mind the fact that Fig is a curated platform when comparing its numbers with Kickstarter’s. Fig is a much smaller platform than Kickstarter, with fewer projects. 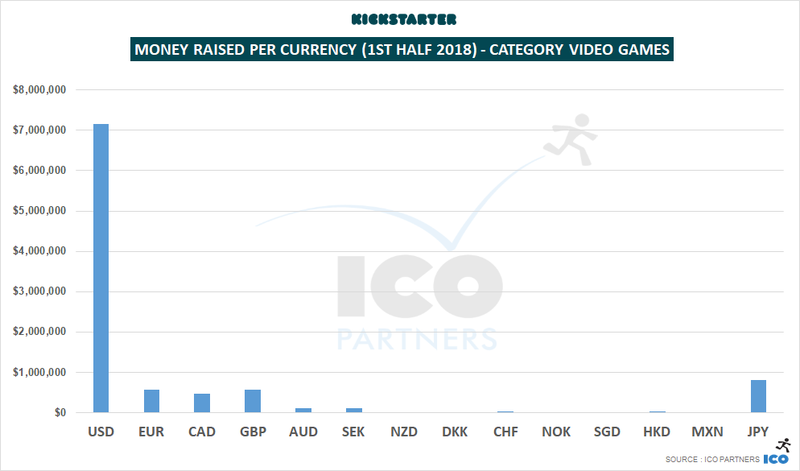 It has done very well whenever a high-profile project was released on its platform, but it is interesting to see its level of funding outside of these large projects is modest, raising on average $40,000 for its successfully funded projects. There is a higher ratio of projects funded on Fig than on Kickstarter, probably thanks to the curation process. 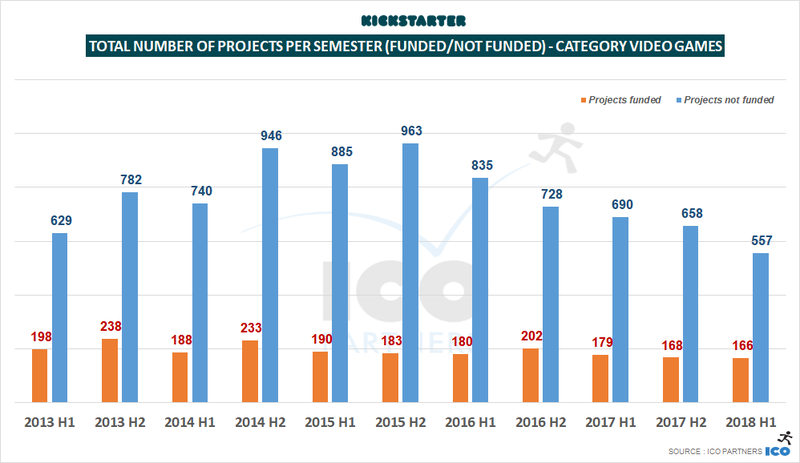 However, the percentage of projects getting funded is significantly lower than previously, in this past semester. The low number of projects means this not necessarily statistically relevant. Beyond the curation, another important differentiating factor for Fig is fact that the campaigns allow users to back for a reward (like on Kickstarter), or as an investment in the project. 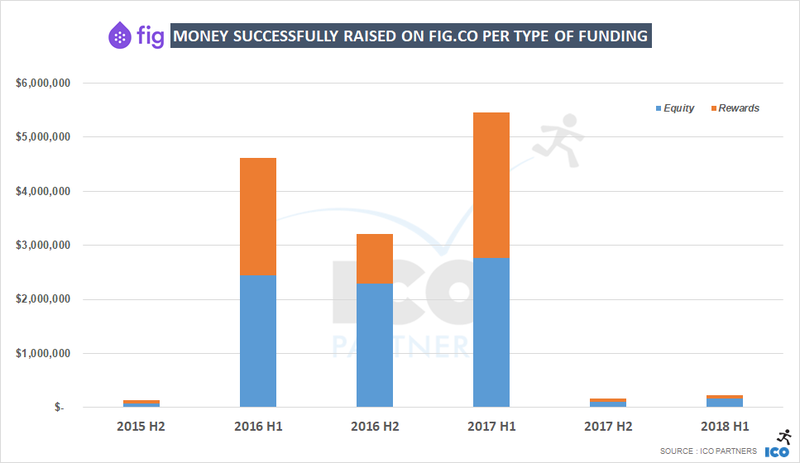 The graph above highlights Fig’s strengths when it goes to lower-profile projects, where it displays an ability to raise Project Equity funds. 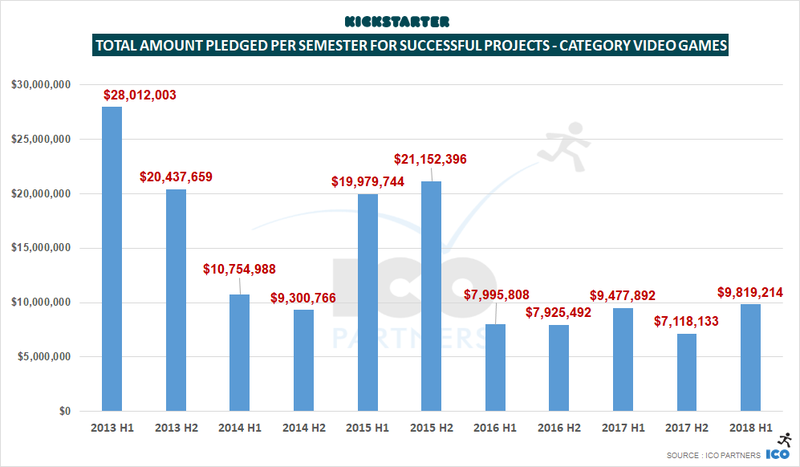 In the first semester of 2018, 75% of all the money raised on Fig was through this scheme, up from 66% the previous semester which had a similar profile (roughly same size of projects and same number of projects). As before though, this might not be statistically relevant considering the low volume of projects. Adding Fig numbers doesn’t tell a very different story when considering the total number of projects funded during the past 6 months. There is a slight drop in number over the past few years, but projects haven’t fled to another platform. As for the total amount of money raised, this is likely the same story too. Large projects have chosen Fig over Kickstarter in the past couple of years, but none in the past 12 months (with the exception of The Good Life, that tried to get funded on Fig in September last year, but didn’t manage to reach its goal then). 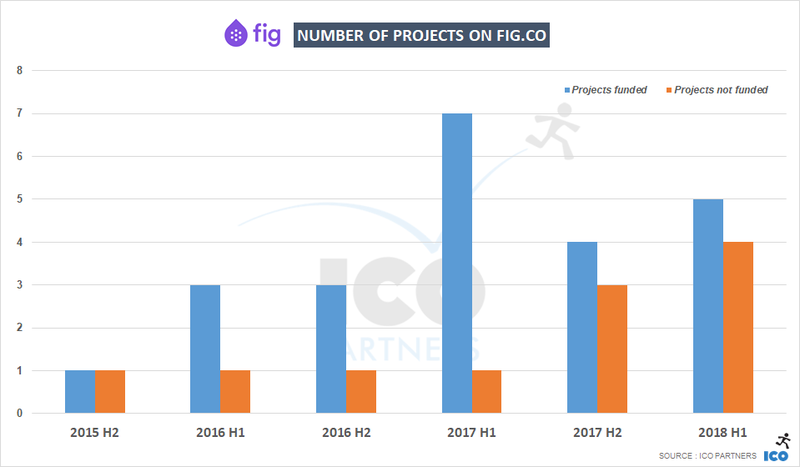 It is interesting to note that the five projects that were successful on Fig this past semester raised a total of $57,000 through the reward scheme of the platform, putting the emphasis on the equity side of their model to get successfully funded, setting the platform apart from Kickstarter which solely relies on the rewards system. 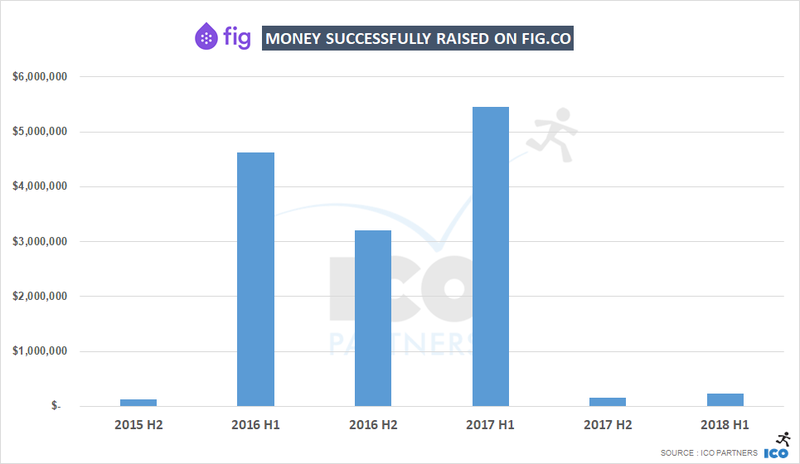 Considering the total amount of money raised in the past year on Fig, and the amount of money it requires to function, it might be interesting for its team to consider either widening its reach and loosening the curation criteria, or, to focus solely on high-profile projects that are making a significant impact on the amounts the platform raises. In a couple of months, I might do a deeper dive into the Fig campaigns as there is much to learn in looking at each of them.